The 6-panel companion pocket guide is jam packed with handy checklists and places for you to record your personal information and contacts. Speaking from firsthand experience...you'll find this invaluable when the pressure is on to evacuate and every minute counts. 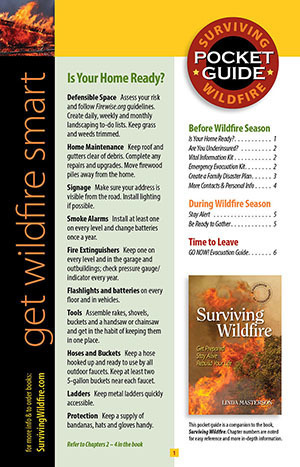 Checklists include an insurance checkup, putting together your Vital Information and Emergency Evacuation kits, creating a family disaster plan, important stuff to gather, how to stay alert during wildfire season, and the GO NOW! Evacuation Guide.